I know a guy who used to laugh about “living large”. Two things remind me of what he meant. A while back I heard a guy on TV talking about people complaining about flying. People gripe about baggage fees and having to buy drinks, and he was incredulous. Think about it, sitting in a chair five miles above the earth flying at 600 miles an hour in air conditioned comfort. What is there to complain about? I bought a new car a couple of weeks ago, and as long as I have the key fob in my pocket, the doors unlock at a touch, and the engine starts with a push button. Seats and mirrors adjust when the car recognizes me and it automatically connects my phone to the navigation system while it stays in my pocket. What is amazing about all this is how easily we are spoiled to living large. I walked to the door of my house this week and found myself standing there waiting for the door to the house to unlock. I knew I had the key in my pocket and had a real moment of frustration when the house door did not unlock as the car does. In my shop, I have one particular living large item. 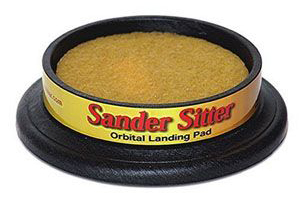 It is the coolest little thing called a “Sander Sitter Carousel” and its sole purpose in life is to provide a place to set your orbital sander while it quits turning. I mean, come on, is that living large or what? Instead of waiting 15 seconds every time you put it down,or stopping it with your hand, you just set it down on the Carousel and go do whatever else you want. The crepe rubber inside and the ball bearing base below clean the sanding disk and absorb the rotation. That’s all it does and it is marvelous. I could get used to this living large stuff. Now if I can just get the house to open when I walk up to the door. I have one of these and it works even if the sander is still running. Really cool. Newbie Chairbuilding Girl: Getting Started Check out the July 2011 Wood News!